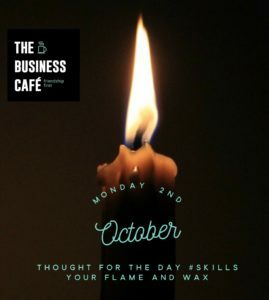 Years ago I heard Roger James Hamilton talk about the power of knowing the parts of our life that make us shine, our flame that can light a million candles, the moment we feel on fire. Equally, our wax, the part of our life that feels heavy, exhausting and diminishes our returns and eventually dulls our flame and the flame dies. A great metaphor for being in business. Usually we start in our flame, we know what drives us, the difference we want to make, we don’t feel tired, we are driven by the sense of purpose. Then aspects of our business life takes over. The inevitable tasks that we have to complete in order to take business seriously. I don’t want to give examples of what could be your flame, and what is your wax, as for each of us it will be different, and that is the beauty of business communities, my flame, may be your wax, and your wax could be my flame. We can’t avoid the wax entirely, but we can do some things to manage it through delegation, processes, time management and acceptance. Skills to understand the areas that you perceive as your wax can also help enormously. I used to fear and dread my accounts, however since I learned how to create a cashflow spreadsheet and cast my eye into the months ahead as my income and outgoings shifted, I began to enjoy inputting numbers, far from pain, this gave me hope. It became a motivator. Implementing Xero, gave me a process for invoicing and managing my Corporation Tax and VAT provisioning, gave me peace of mind, instead of the dread of the tax man. Skills in delegation gave me the time to work in my flame, realizing that a Virtual PA does not cost as much as I thought and gave me days and days back in my month plus Anita Turner‘s skills in managing my diary made me far more productive. Finding Rick O’Neil within our community here and asking him to manage our website hosting and web development, taking it away from an incompetent supplier, gave us a huge boost in how we could manage our strategy. You must have your list of tasks and routines in your business, if not, then may I suggest as you go about your week, write down the moments in your day when you know you are spending time adding to your business, the feeling of flame, a tingle in your back that says.. “this is what I was born to do, this is where I give the most value to my clients and my business”. Then also right down the moments your know your time is not well spent, you are in your wax, you could delegate this, and note why you are not. Is it time to get on top of the issue, money to delegate, lack of skills or connections to delegate to the right person. My suggestion is that if we hang onto our wax, we will exhaust ourselves and even get quite low, and it is so hard to build a business in this emotional state. It really doesn’t cost as much as we think to delegate some of the wax. As Rick says in his blog, even a small bank loan could enable you to get ahead, and when you see the impact of the right processes, skills and people around you, the inevitable growth in your business will happen.